On April 1, 2012, Woolwich Fire Co. Sta. 25-1, Logan Twp. Fire Dist. 18, Harmony Fire Co. Sta. 23-1, and Gloucester County EMS were dispatched to the area of Kingsway High School for a reported working dwelling fire. 25-103 arrived with heavy fire showing from the 2nd floor of a 2.5 story vacant dwelling. Command requested the all hands struck, bringing Reliance Fire Co. Sta. 12, East Greenwich Fire Co. Sta. 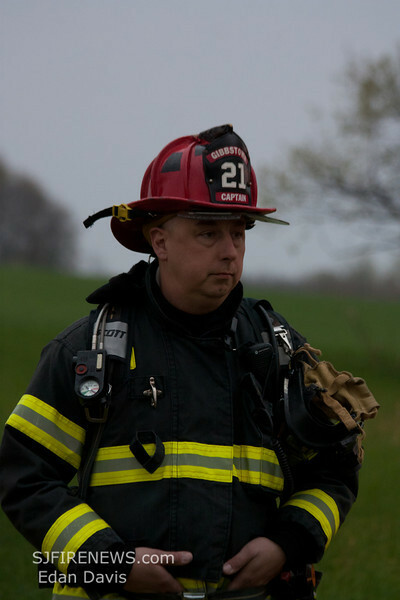 19-1, Gibbstown Fire Co. RIC 21-1, and Harrisonville Fire Co. Sta. 36-1 to the scene. Ladder 25-16 was placed in service and quickly knocked down the heavy fire. Engine 19-11 was diverted to set up a fill station at a nearby pond. Units remained on location for some time to knock down the hotspots. Gloucester County FM is investigating. Woolwich Twp. PD also assisted at the scene.